The specialty silica market continues to witness robust growth due to increasing demand from the auto manufacturing and cosmetics industries. Rise in auto sales globally and increase in green tires in the industry are one of the key factors driving the specialty silica market. Increased concern among urban dwellers globally about dry skin disorders and unique properties of specialty silica such as UV protecting, dispersive nature, and anticaking, are predicted to drive the specialty silica market. Conversely, the specialty silica market’s growth can be restrained by high costs of products, which are exacerbated by cheaper available alternatives. The paper industry’s below average growth is also expected to adversely impact the specialty silica market. The global specialty silica market was estimated to reach US$4.62 bn in 2016. The market is expected to rise at 5.9% CAGR during 2016 - 2024. The specialty silica market is likely to reach US$7.32 bn by the end of 2024. The total volume in the market is predicted to reach 5,185.0 kilo tons by the end of forecast period. The specialty silica market is divided into crop protection, rubber, electronic components, paints and coatings, personal care & cosmetics, food & beverage, plastics, animal feed, and a collective segment of small or specialized applications. This segmentation is based on various applications of specialty silica. In the recent past, rubber manufacturing has generated the highest demand for the specialty silica market. In 2015, rubber manufacturing surpassed 50% of value in the specialty silica market. This demand was largely driven by key rubber products used globally including tires, footwear, industrial apparatuses, and equipment. In the near future, this demand is expected to grow significantly. Specialty silica applications in the manufacturing of rubber tires plays a key role in reducing friction and consequently, improving fuel mileage. Growing demand for fuel efficiency and increasingly stringent emission norms are expected to drive growth for in the specialty silica market. Asia Pacific (APAC) held the largest share of the global specialty silica market in 2015. Its share amounted to 45% value of the global specialty silica market in the same year. The Asia Pacific region is expected to lead the specialty silica market during the forecast period as well. Growing manufacturing in china, increased automotive sales globally, and rising production as well consumption rates are expected to drive the Asia Pacific specialty silica market during the forecast period. The specialty silica market in North America is also expected to grow significantly during the forecast period. Increased demand in the auto industry and electronics industry is expected to drive this market as well. The specialty silica market in Europe is expected to present a mix bag of opportunities and challenges. It is expected pick up pace with the consumer electronics industry. The established players in the global specialty silica market are looking for opportunities in the Middle East and Africa due to increased demand in personal care and cosmetics industry. The global specialty silica market constitutes a consolidated but competitive landscape. The major players account for 50.0% of the market’s total value. The main players in the market are Evonik Industries AG, Cabot Corporation, Wacker Chemie AG, PPG Industries, Inc., Huber Engineered Materials, Solvay S.A., Tokuyama Corporation, and W. R. Grace & Co., Akzo Nobel N.V. Specialty silica is silicon dioxide, which is majorly available in the form of quartz in nature. The five basic type of specialty silicas available in the market are: precipitated silica, fumed silica, fused silica, silica gel and colloidal silica. specialty silica are employed in various applications such as rubber, crop protection, paints & coatings, electronic components, food & beverage, animal feed, plastics, personal care & cosmetics, textile, paper, refractories and others. Rising demand for specialty silica in the tire industry in various regions is likely to propel the specialty silica market in the near future. Specialty silica are also used in paints & coatings, electrical & electronic, and other applications industries. Demand for specialty silica is projected to increase significantly in the next few years considering the extensive growth of the global rubber and microelectronics market. Asia Pacific dominates the specialty silica market in terms of production and demand. Countries such as China, India, Japan, and South Korea are expected to be the key consumers of specialty silica. North America is the second largest consuming region. Availability of inexpensive substitutes for products such as colloidal silica and silica gel is expected to hamper the specialty silica market in the forecast period. Furthermore, sluggish growth of end-user industries such as paper, cat litter and paints & coatings in the developed regions such as Europe is expected to hinder the specialty silica market in the near future. These factors are projected to unfavorably affect market growth during the forecast period. This report analyzes and forecasts the market for specialty silica at the global and regional level. The market has been forecast based on volume (KILO TONS) and revenue (US$ Mn) from 2016 to 2024, considering 2015 as the base year. 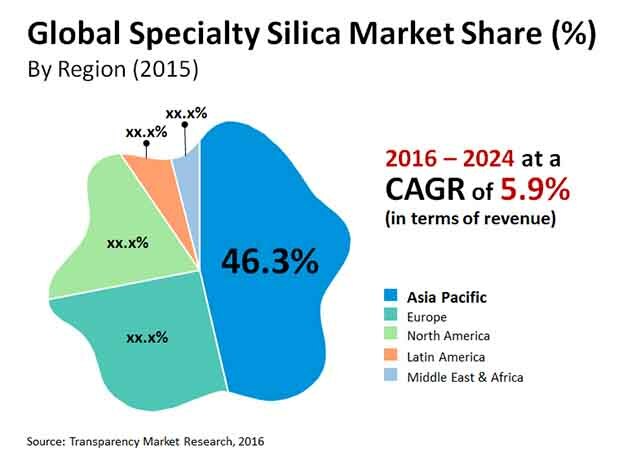 The study includes drivers and restraints of the global specialty silica market. It also covers impact of these drivers and restraints on demand for specialty silica during the forecast period. The report also highlights opportunities in the specialty silica market at the global and regional level. The report includes detailed value chain analysis, which provides a comprehensive view of the global specialty silica market. Porter’s Five Forces model for the specialty silica market has also been included to help understand the competitive landscape in the market. The study encompasses market attractiveness analysis, wherein end-users are benchmarked based on their market size, growth rate, and general attractiveness. Secondary research sources that are typically referred to include, but are not limited to company websites, annual reports, financial reports, broker reports, investor presentations, SEC filings, Plastemart magazine, BP magazine, Institute of Sciences, FAO, internal and external proprietary databases, and relevant patent and regulatory databases such as ICIS, Hoover’s, oneSOURCE, Factiva and Bloomberg, national government documents, statistical databases, trade journals, market reports, news articles, press releases, and webcasts specific to companies operating in the market. The study provides a decisive view of the global specialty silica market by segmenting it in terms of product type (precipitated silica, fumed silica, fused silica, silica gel and colloidal silica) and applications such as rubber, crop protection, paints & coatings, electronic components, food & beverage, animal feed, plastics, personal care & cosmetics, and other (textile, paper, etc.). These segments have been analyzed based on present and future trends. Regional segmentation includes current and forecast demand for specialty silica in North America, Europe, Asia Pacific, Latin America, and Middle East & Africa. The report provides the actual market size of specialty silica for 2015 and estimated market size for 2016 with forecast for the next eight years. The global market size of specialty silica has been provided in terms of volume and revenue. Market volume has been defined in kilo tons, while market revenue is in US$ Mn. Market numbers have been estimated based on product type and key applications of specialty silica. Market size and forecast for numerous end-users have been provided in terms of global, regional, and country level markets. The report comprises profiles of major companies operating in the global specialty silica market. The global specialty silica market is partially consolidated. Key players include Evonik Industries AG , Cabot Corporation, Wacker Chemie AG, PPG Industries, Inc., Tokuyama Corporation, Huber Engineered Materials, Akzo Nobel N.V., Solvay S.A. , and W. R. Grace & Co. Market players have been profiled in terms of attributes such as company overview, financial overview, business strategies, and recent developments.